The handy Style CS is one unique clip-on multi-tool. With spring-action scissors, a file, knife, tweezers, bottle opener and mini-screwdriver, you'll never be without your most necessary tools. Fits in a pocket or clips on your pack or bag for easy portability. So stylish it's almost a shame it fits so easily in your pocket. Closed length: 2.9 inches (7.5 cm); Weight: 1.4 oz (41.1 g); Blade length: 1.6 inches (4.06 cm). READY FOR ANYTHING: The handy Style CS is one unique multitool. Stash in your pocket or clip on your bag or pack for ultimate accessibility. And, it's so stylish it's almost a shame it fits so easily in your pocket. FIT MORE FUNCTIONALITY: Knife, spring-action scissors, flat and Phillips screwdriver, tweezers, nail file, and combination carabiner and bottle opener. LET'S BE PRACTICAL: Sometimes you just need a knife. 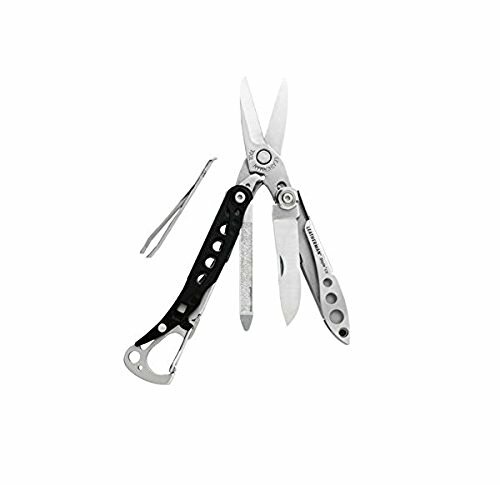 With the Style CS's outside-accessible tools, you can get the functionality of a pocket knife in a multitool. ALWAYS ON HAND: With its compact size, lightweight design, and key ring hole, your Style CS is always within reach and ready to work. GUARANTEED: We go to extraordinary lengths to make sure your Leatherman gives you many years of dependable service. If it doesn't, we've got your back with our 25-year limited warranty. Just send in your tool and we'll fix it up. View More In Multitools & Accessories. If you have any questions about this product by LEATHERMAN, contact us by completing and submitting the form below. If you are looking for a specif part number, please include it with your message.